We are most popular service center for laptops and desktops repair service in all over Hyderabad city. We are a specialized for acer laptop and desktop repair service. Our very dedicated service engineers have a good service knowledge and provide prefect customer coordination and maintain the correct timeline. This are all features we have to topper in the Hyderabad, especially in Ameerpet and Kondapur locations. 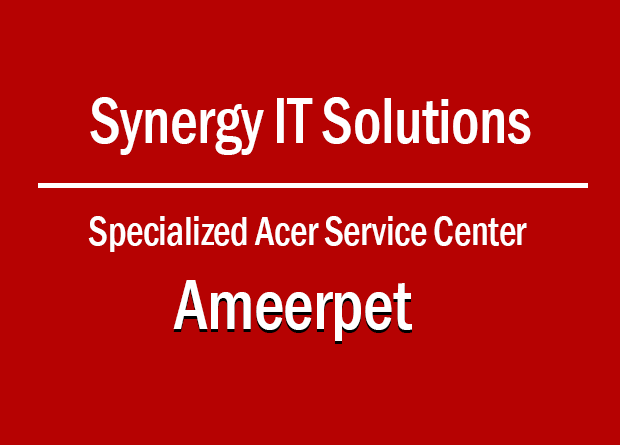 Synergy it solution established in 2008, laptop service is fast growing business build in Chennai city. We have a more than 10 branches in Chennai and Hyderabad city. Now laptop service is very growing business in Hyderabad city especially in Ameerpet, Kondapur, Kukatpally, Uppal and other nearby Hyderabad and secunderabad places. We are undercover telungana districs also. We are specialized in Acer Repair Service and upgrade your laptop and desktop peripherals. We have experience to service for chip level and component level main board repairs, LCD repairs, data recovery, laptop general service, touchpad replacement, audio and network connector service and other hardware faults. We are also one of the leading laptop and service repair center (Synergy IT Solution) companies in Acer Original LCD / LED Screen repairs and replacements. we are most popular service center near ameerpet location, hyderabad. our experienced engineers provide excellent repair solution for your hp, dell, apple, lenovo, acer, asus, toshiba laptops. our first focusing is my customer stratification and provide quick repair solution to my valuable customers. our main vision is import our quality to provide greatest services to our customers.